Pizza Pinwheels a perfect evening snack. It is super easy to prepare, even kids can make them with if they can handle the baking part. This recipe can be made with few more ingredients like your favorite veggies or meat. Chop and add them along with cheese and pizza sauce, roll , cut and bake. As the theme suggests for only 3 ingredients I have made basic pizza pinwheels. I have added triple cheddar cheese for this recipe, you can go ahead and add any cheese of your choice. SO this recipe goes tot he 3rd day of Blogging Marathon 85 under the theme " 3 Ingredient recipes". Thaw the puff pastry sheets to room temperature. Spread the pizza sauce all over the pastry sheet. Sprinkle your favorite cheese on top. Roll the pastry sheet slowly as shown in the picture. Cut the rolled puff pastry into 1 inch thick pieces. Place each piece on a greased baking tray 1 inch apart . A sugar cookie is a cookie with main ingredients being sugar, flour, butter, eggs and baking powder or baking soda. They can be either decorated with icing or any sprinkles. They can be given any shape of your choice. Today I have made simple cookies, to give the cookies nice look and attractive for the kids you can always add some sprinkles on top before baking the cookies. These cookies are perfect to bake during Christmas. This recipes goes to the 4th week , 2nd day of Blogging Marathon 85 under the theme " 3 ingredients recipes ". Using hand blender or electric mixer to cream the sugar and butter together. Whip the two until the mixture is light and fluffy. Now add flour and stir it to nice dough. Make 1 inch balls with the cookie dough and place them 2 inches apart on a greased baking tray. ( Optional) Flatten the dough little bit and top with sprinkles. Protein rich egg dosa is a simple, quick and filling breakfast for kids and grownups. There are many variations for this delicious dosa. Its up to you what veggies you want to add as topping. Today as the theme suggests to cook only with 3 ingredients, I have made a simple and tasty egg dosa. I have used curry leaf spice powder for this recipe, you can go ahead and use any spice powder of your choice or just add chili powder or sambar powder on top. I have not used any salt or chili powder here as curry leaf powder has all of them. This recipe makes a great breakfast dish or after school snack. Chop some of your favorite veggies and add for the filling or even you can sprinkle some grated cheese of your choice. Mooli or radish paratha is yummy and delicious Indian flat bread which is very popular in Punjab, India. This recipe varies from different regions, some stuff the paratha and some mix the grated radish in the dough itself to make it easy to prepare. This is a perfect breakfast dish which is not only healthy but also a filling dish. Perfect to pack for lunch boxes or for a long journey. Khara Bhath is a famous breakfast dish in Karnataka , India. This dish is loaded with veggies and sambar spices. A great and delicious breakfast made with in no time. This looks similer to our regular sooji upma made in Andhra Pradesh, Tamil nadu or rest of the states in India. Only difference would be addition of Sambar powder in Khara Bhath. Heat a medium size pan and add oil / ghee. Add mustard seeds, cumin seeds, chana dal and udad dal. Pesarattu Upma is a traditional breakfast dish of Andhra Pradesh. 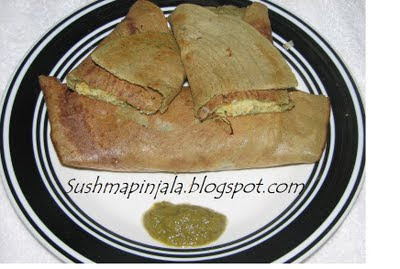 ( Pesara -attu) Pesara means whole green gram, attu means dosa. This dosa is healthier than the regular dosa as whole green grams has more nutrients than the other dosa. This dosa is typically served with upma which will be stuffed inside dosa, alongside ginger chutney. Doesn't need any fermentation time, just soak the dal, grind and the batter is ready to make yummy dosa's. It is easy to make , healthy and delicious.